Marc Singer – the actor who played human freedom fighter Mike Donovan in the original V is coming back to the new V in January. which is still screwing up the show with messy return dates and long delays…but lets hope they put enough marketing muscle into the January return to keep this show going for at least the rest of the first season. Another fine episode — where we discover that the STO has a very highly placed mole in the Caprica police force. the way the mole is discovered/exposed is really quite clever and the cinematography with the two woman walking on the path – which one will be killed? is stellar. Caprica as a show likely just needed time to mature — but the final five episode— so far – are really turning out well. Caprica may have been canceled but the final episodes have been avail in Canada and we’ve now had the chance to watch some of ’em. The entire season 1.5 dvd is out in December. We finally see the Cylons used for the purpose they were intended – to kill humans. Sam Adama is the first human to use the Cylons that way and he gets the best greeting a Battlestar Galactica fan could ask for. A lot of great deals for SciFi comic book and toy lovers to look at this Black Friday. How about a Battlestar Galactica Series 3: Razor Kendra Shaw for only $5 ? Or Battlestar Galactica Origins TPB Vol. 1 Adama for $5.99? It’s also a good time to jump into Steven King’s Dark Tower comic books too with 60% off the cover price for hardcover graphic novels. For Star Trek Fans, how about Star Trek II: Regula 1 Admiral Kirk Action Figure FOR $6.39? And for Star Wars comic book fans how about Star Wars Ominbus: Tales of the Jedi for $9.98? Fringe is a great show, which is why it is so shocking that FOX is killing it off. Oh they’re not killing it like the cowards at SyFy that cancel a show midway through a season then don’t air the final episode.. The hell called Friday night. No SciFi show ever survives the Friday night timeslot and Fringe won’t be the first. Malice was a fine episode – all action from beginning to the end. Shocking in a way that Gin was killed – perhaps even more shocking was that both Gin and the professor at the other end died. Shouldn’t it have been that just the body died and Gin would have been trapped on Earth in the parpalegic’s body? Also the whole deal with the crew not being able to stop the clock seemed odd – Rush was able to drop out of FTL before without a clock so why was this time different? 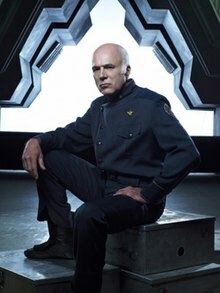 Actor Michael Hogan – perhaps best known to scifi fans as Col. Saul Tigh from Battlestar Galactica made his debut on Smallville this week. Kinda of a wimpy, whiny episode but..
was neat to see how Smallville producers are preying on scifi fans sense of nostalgia. At the end of the episode ‘Tigh’ get an eye patch – a la BSG. Wow – what an awesome episode. Olivia saves Broyles son..
then realizes that she hasn’t and that there is a master crook still at large..
And the FBI slip? Brilliant – the FBI was disolved a decade ago on this side…so now what? I’m going home…. Let’s not forget the final frames..FINALLY Bolivia will be exposed for the fraud that she is…how could she not know what Casablanca is about? Sheldon always has some …interesting ideas. That’s where Sheldon though that Leonard might have gone in the future and then transported back through time. Doctor Who: The Complete Fifth Series is now out on DVD – so Matt Smith is now making the talk show rounds. Last night he showed up on Craig Ferguson (aka Mr. Wick from the Drew Carey show) The Late Late Show.. The Greater Good episode (–click to catch in Amazon), was one of the best episodes of SGU yet. Finally, the crew get to see the bridge and FINALLY beat Rush at his own game. But WTF is the nonsense about Destiny’s mission? A mission to find…the construct behind the background cosmic radiation?? DESTINY is on a Mission to Find GOD. Remind anyone of Star Trek V? (and yeaah that movie sucked). That said, we’re worried about Gin — and given the dark slant of this show, she’s likely in a world of trouble. Radio broadcast from the beginning of time with co-ordinates for the weapon? But why did the shapeshifter from the other side want to bring down a plane or was that just un-intentional? We don’t know…Fringe is always a bit weird but this recent episode left us a bit lost. Bolivia is awesome though, she’s a real killer. Another fine episode though, and the Raiders -like escape at the end was just classic too. The first bits of TR2N — now renamed as Tron Legacy that saw two years ago at ComicCon were unexpected and they were awesome. The first official trailer totally blew our minds and the second one FRAKKING awesome. The third trailer — is cool. We’ve already seen most of this before, we know what to expect and at this point, we just want to see the movie already!! The BBC has releases a set of really funny and interesting out-takes from Matt Smith’s first season as Doctor Who –with the lovely Amy Pond in tow of course. An interesting discussion on why the Tardis is a police box..and does the Doctor have to change the light on the top? And does he feel stupid about traveling in a wooden box? 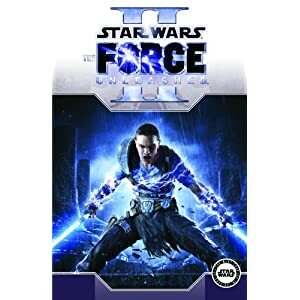 Star Wars: The Force Unleashed Volume 2 is great comic book read…but it’s not quite what we had expected. This comic book isn’t Starkiller’s story..
and it’s not quite the same as the game — even though it’s written by the same guy that wrote the game’s story. This is the story of Boba Fett – yeah Han Solo in Carbonite Boba Fett. Then he hunts down Starkiller — only to stop and not KILL him as he could/should have, because he was hanging onto to Juno Eclipse and he got soft. YEAAAAH Boba Fett gone LAME. And what’s the deal with Vader being captured? ARe you kriffing kidding me? It’s just a crude setup to ensure that there will be a third version of the game. Like we set though…a fun read and something that all star wars fan will enjoy. A bit of a corny episode this week — General Lane, played by the always affable Michael Ironside, make his return and apparently he doesn’t care for the vigilantes…no surprise there.. BUT he does like the Blur being Lois’ special protector..
Olivia isn’t going to stay in the alternate universe for long…or is that Bolivia? (alternate Olivia)?? In any event FRAK baseball, Fringe is Baaack!! Quinlan Vos is one of the greatest Jedi ever created by Dark Horse — and until now he has exclusively existed only in the comic books. But now at long last he’s coming to TV in Season 3 of the Clone Wars! Quinlan is cool because he’s kinda like Cade Skywalker (Legacy) in that he’s got powers like a Sith but he’s got a good heart. He’s been to the Dark Side (and back), but the difference btwn Light and Dark can be a blur for him. Eli is our favorite character on SGU. His greatest flaw is his love for the mega-wench Chloe who is now more alien than human anyways.. But in the upcoming Season 2 Episode 7 – The Greater Good – episode, Eli finally gets some satisfaction as he hooks up (see the final frame in the teaser below) with a one of the leutian alliance prisoners.